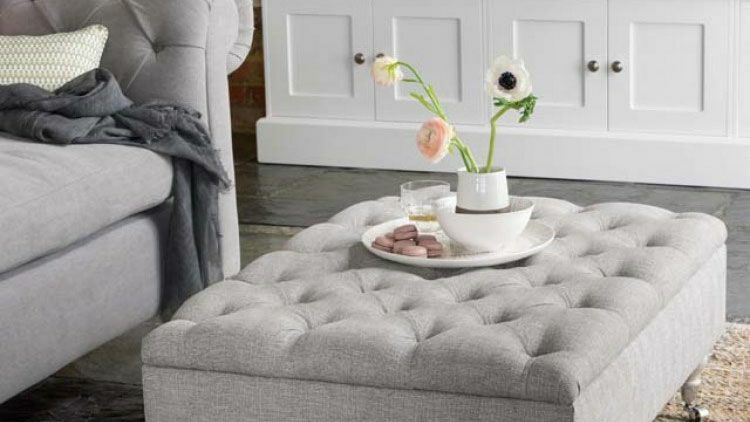 A footstool is top of the list when it comes to versatility in the living room and can be used as extra seating, or even as an impromptu occasional table. If yours is looking a little run-down, consider reupholstering with a gorgeous fabric and the help of our guide to how to re-cover a footstool. For more inspiration and tips on how to choose upholstery, take a look at our guide. Use our checklist below to ensure you've got everything you need to re-cover a footstool. Begin by ‘ripping down’ or stripping off the old fabric covering and trimmings. This can be hard work and time-consuming if the previous upholsterer was over-zealous and has used an excessive number of tacks or staples to secure the fabric. Tacks are best removed with a ripping chisel or tack lifter. Take out all tacks and staples. Use pincers to pull out nails and tacks that have been knocked hard into the frame. A staple remover lifts out unwanted staples. Long-nose pliers can prise out those that are difficult to reach. Now inspect the padding: add more, depending on whether a firm or soft finish is required. Use the discarded fabric to measure for the new upholstery. If you have added more padding then allow extra fabric to accommodate the increased depth. Lay your chosen fabric over the stool making sure it is positioned centrally and smooth out wrinkles. Secure in place with upholsterer’s skewers or pins. Start in the middle of a long side and staple the fabric to the frame. Continue stapling from the middle but leave the corners. Do the opposite side keeping the fabric pulled tight. Pull fabric over corner to create a pleat and staple. Fix the opposite corner. Continue working from the corner towards the middle. Piping can be used to conceal fixings. Cover a piece of piping cord in fabric of your choice – a complementary colour will create a contrast. Cut lengths of fabric about 4cm wide. Strips can be joined together at an angle to create a tidy join. Pull the finished piping tight as you staple it in place. Measure and cut fabric to cover the lower part adding a 10cm turning allowance. Turn over 5cm and make a hem. Place right sides together so concealing the fixing. Staple in place against the piping. Keep the fabric pulled taut. Use pieces long enough to cover each side. Avoid bulky corners by pleating the fabric neatly. Turn the footstool over to fix the fabric to the underside. If you can unscrew the legs this will make the job easier. Use a piece of hessian to cover the bottom. Tack cloth to the middle of one side then pull firmly as the opposite side is secured. Repeat on other sides. Fold hessian to form corners and tack in place. For a finishing touch attach beaded trim or fringing with a glue gun. If you’ve never used a glue gun before, practise first. If in doubt attach trimmings with needle and thread or secure with gimp pins (tiny painted pins which come in a range of colours to fasten trimmings inconspicuously). Looking for more up-cycling ideas and inspiration?